Contrary to online reports, the Hollywood actor apparently did not attend the recent premiere for the schoolgirl anime Love Live. Cosplayer PipPip originally uploaded a photo of Nicolas Cage (not the above image, mind you) , writing, “So I ran into Nic Cage before the Love Live movie. His son likes anime apparently.” PipPip’s photo quickly spread around the internet. In the photo, Cage was decked out in a leather jacket. You could see anime posters and Kamen Rider actor autographs in the background. Online on Reddit, seeing Nicolas Cage before going to the Love Live premiere, became Nicolas Cage watched the Love Live movie premiere. Which is different! The wording in the original Facebook post could be misconstrued, so it’s easy to see how the mix-up might’ve happened. The actor did appear in stores that sell anime and comic book merch in the past, so this isn’t that unusual. Cage seems to be into that kind of stuff, which is cool. But was he at the Love Live premiere? 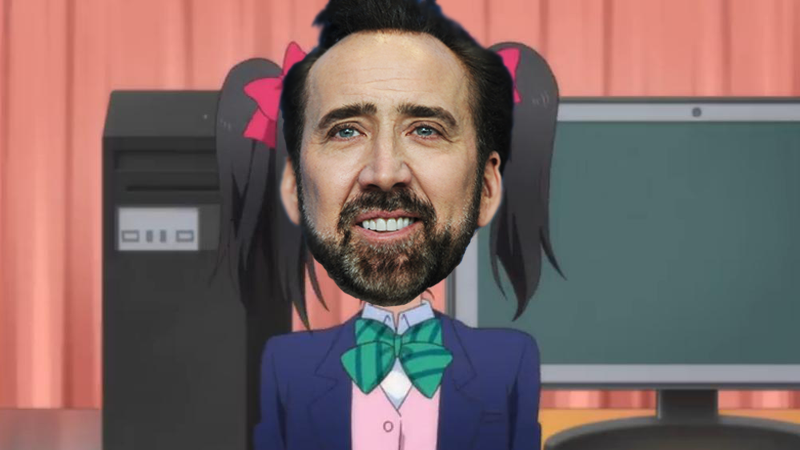 I was the one who originally posted the picture of Nic Cage before the Love Live movie. LET ME MAKE THIS CRYSTAL CLEAR. HE DID NOT SEE THE MOVIE, I BUMPED INTO HIM AT A STORE IN LA BEFORE I WENT TO SEE THE FILM WITH MY FRIENDS. ANYONE WHO SAID HE WAS AT THE PREMIER OF THE MOVIE IS SPREADING FALSE INFORMATION. Please reblog this posts to let everyone know. Also, as I mention in my fb post, PLEASE INFORM ANYONE WHO REPOSTED MY PICTURE TO TAKE IT DOWN IMMEDIATELY. I do not wish for the image to float around the internet any longer. Thank you.